Designed and tooled from the ground up, the speakers meet the demand of today's high performance amplifiers while maintaining factory dimensions for original location mounting and are compatible with all digital music sources. The "N" Series features 4 models that feature ultra thin 1.3" mounting profiles to fit in virtually any installation application. These 4 models with neodymium magnet structures which are 5 times more powerful than standard speaker magnets, allowing for a substantial reduction in mounting depth and feature enhanced power handling and heat dissipation characteristics. Their Dual Voice Coil design (on 3 models) allows you to connect 2 stereo channels from your radio to one speaker, providing you with maximum sound for a single speaker application! 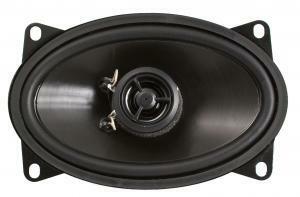 These 4x6" oval speakers come with custom flame grills and a US or Euro removable metal mounting adapter (for vw's or other euro cars), they are designed and sized to fit in an OEM or a custom location, due to their ultra thin mounting profile, you can mount it places other speakers cannot fit. Please note that you are purchasing TWO 4x6" Single Voice Coil speakers, which are full range speakers with a low profile cool flame style Mylar tweeter assembly, Single Voice Coil System, rigid poly cone, Santoprene surround, 1.65" thin mounting depth and custom tooled low carbon steel chrome basket.